Create an empty database with the RDBMS in use and register an ODBC data source associated with the created database. For example, name it pvTEST. To correctly register the data source on 64-bit systems, you must use the 32-bit DSN management program. 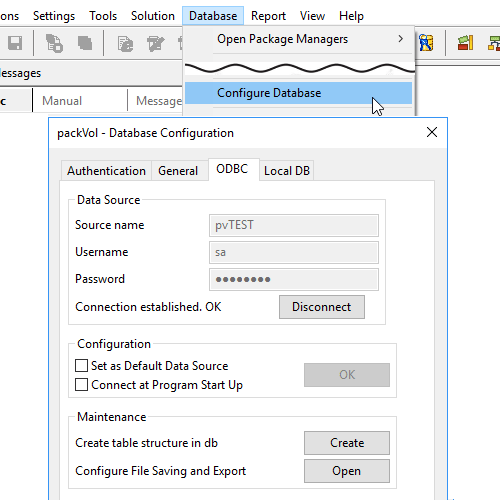 Launch packVol and open the ODBC configuration dialog with the Database → Configure Database menu command or the tool. Select the ODBC tab. Enter your credentials and connect by pressing the Connect button. Create the tables needed by packVol with the Create button located in the Maintenance control group. A warning message informs you that all data will be erased. Click Yes. Within the RDBMS, populate the pv_job, pv_cnt e pv_sku tables. To import data, press the File → Import (ODBC) menu command (shortcut key Ctrl+Shift+O). In the dialog that pops up, select the row in the list and press OK, or double-click on the row. Optimize the imported plan as explained in Tutorial 1. 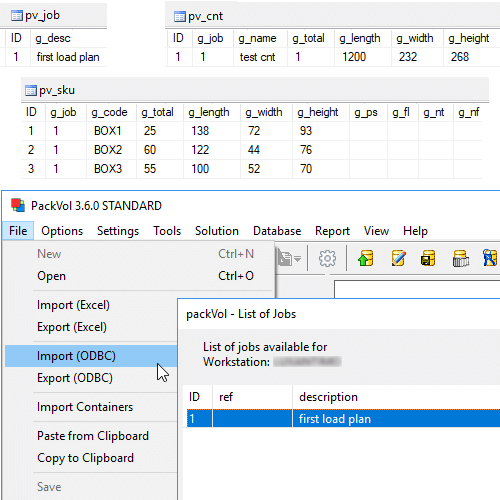 Export the solution with the File → Export (ODBC) menu command (shortcut key Ctrl+Shift+S). Within the RDBMS, check the contents of pv_job, pv_bin and pv_geom tables. You can automatically generate reports during export. Open the ODBC configuration dialog as explained in Step 1 and press the Open button located in the Maintenance control group. In the dialog that pops up, choose the working folder and select the types of documents you want to create, such as the PDF report. 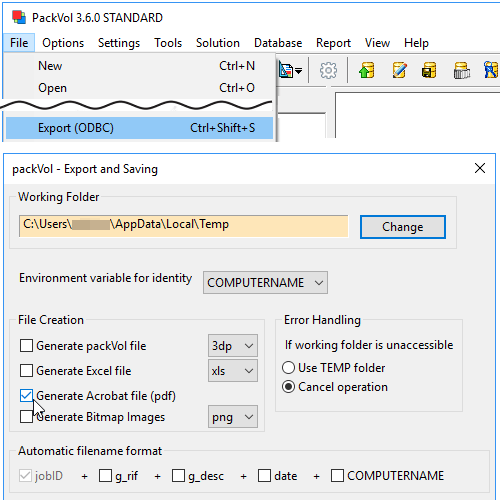 Repeat data export and check the contents of the working folder.